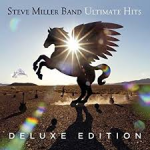 Share the post "Album review: STEVE MILLER BAND – Ultimate Hits"
This hits set is available as a single disc and a two disc edition which features 4 previously unreleased live tracks, 3 previously unreleased studio tracks and a previously unreleased demo. It is released ahead of a planned re-issuing of all the Steve Miller Band albums which will follow in the coming months. Looking at the past history of the Steve Miller Band he has had many talented musicians work with him including Boz Scaggs, Nicky Hopkins and Journey’s Ross Valroy (the Steve Miller Band have toured many times with Journey). You can tell Steve Miller knew he wanted to be a rock ‘n’ roller from his early days as the collection opens with him aged five talking to his godfather Les Paul. Les Paul was certainly right when he told the then five year old Steve Miller he would make a career out of music! Of course his big hits are on here, including ‘The Joker’ (which was a UK number 1 back in 1990 thanks to being used on a jeans advert! ), a live version of ‘Space Cowboy’ (the band’s early years and psychedelic side highlighted on this song), ‘Fly Like An Eagle’, ’Abracadabra’ (80′s synths mixed with the band’s normal rock sound), ‘Jet Airliner’ and ‘Rock ‘n Me’. Plenty of live songs on here, as the Steve Miller Band are like Bob Seger & the Silver Bullet Band, both making their names from constant touring of the US during the 1970′s and 80′s. Much of the compilation is drawn from the 70s’ and 80′s studio and live albums, although ’Don’t Cha Know’ features from 2010′s blues covers album ‘Bingo!’. The previously unreleased material will be of interest to fans and it includes a lovely ballad ‘Baby’s Calling Me Home’. ‘Seasons’ is another slow number, Steve Miller’s plaintive vocal backed by gentle acoustic guitar – listening to both songs you do wonder why they have never been released until now. There is also a decent cover of ‘In The Midnight Hour’, although that is not a patch on the other two songs. This entry was posted in ALBUM REVIEWS, ALBUM REVIEWS (Mobile), All Posts and tagged album, blues, Boz Scaggs, classic rock, Les Paul, review, rock, Steve Miller, Steve Miller Band, Ultimate Hits. Bookmark the permalink.